Eddie Johnston's storied hockey career concluded in the most spectacular possible manner  winning the Stanley Cup. Although Johnston will continue with the club in a reduced capacity, after serving the Pittsburgh Penguins for 25 years, he will reduce his role with the club substantially. "I won't be doing all the day-to-day duties, but I'll still be around," he stated. But as incredible as it sounds, winning the Stanley Cup with Pittsburgh this year is just one of the many highlights from an extraordinary career. Born and raised in Montreal, Ed was part of the Montreal Canadiens' organization as a teenager, but was sold to the Chicago Black Hawks in September 1959. Although he attended Chicago's training camp that fall, no one was going to usurp Glenn Hall at that junction, so Ed played several seasons in the Western Hockey League, honing his skills and waiting for his break. It came when he was claimed by the Boston Bruins in June 1962. The Bruins were a woeful club back then, finishing out of the playoffs for three straight years and going through netminders like water. But that, curiously, was good news for Eddie. He was able to step into the Bruins' crease and stayed there until May 1973. During that time, Johnston saw the team evolve from a perennial also-ran (they didn't make the playoffs in Ed's first five seasons with the team) into one of the most successful franchises of that era. Johnston's daughter Michelle hosted a private party at her home for family and friends. With astute acquisitions, not the least of which were Bobby Orr and Phil Esposito, the Bruins became Stanley Cup champions in 1970 and 1972, with Ed sharing netminding chores with Gerry Cheevers. In fact, Johnston was so impressive that he was selected as one of three goalies  the others were Ken Dryden and Tony Esposito  to play for Team Canada in the landmark Summit Series versus Russia in 1972. Ed didn't see action during the eight-game series, but was an integral member of that team. Johnston ended his playing career with turns in Toronto, St. Louis and Chicago before retiring at the conclusion of the 1978-79 season. In 591 regular season NHL games, Ed won 236, lost 256 and tied 87 games, with a goals-against average of 3.24. At the time of his retirement, he was ninth in games played by a goaltender, sixteenth wins and sixth in losses. Also of note, Ed was the last National Hockey League goaltender to play every moment of his team's regular season, playing all 70 of Boston's games in 1963-64. After retiring, Johnston moved into coaching, and after a season in the American Hockey League, he joined the Black Hawks in 1979-80, taking them from worst to first. After one season, he was hired by the Pittsburgh Penguins as head coach, and remained behind the bench until 1983 when he was promoted to general manager. One of the highlights of his management career was drafting Mario Lemieux in the 1984 NHL Entry Draft. "The thing I'll remember most was making the decision to keep Mario," reflected Johnston on the Penguins' website. "He was the one that got people back in the stands. That, I thought, was the turning point for our franchise." Ed remained with the Penguins until 1989, when he moved to Hartford as GM of the Whalers, but returned to Pittsburgh as head coach in 1993-94, remaining behind the bench until 1996-97. Ed is the all-time Pittsburgh Penguins' coaching leader in regular season games (516), wins (232) and losses (224). From 1997-98 to 2005-06, Johnston was the Penguins' assistant general manager, and then was named Senior Advisor for Hockey Operations in 2006-07. On Saturday, July 11, it was Ed Johnston's much-deserved day to celebrate with the Stanley Cup. The morning was spent with Ed taking the trophy to The Club at Nevillewood, one of the finest golf courses in western Pennsylvania and a country club to which Ed belongs. Members had their pictures taken with the Cup. Through the course of the day, Johnston used the opportunity to showcase hockey's greatest prize to help raise money for the Mario Lemieux Foundation, whose objective is to fund medical research into conquering cancer. Ed made stops at two of his favourite restaurants, both in Upper St. Clair. First up was StonePeppers Grill, followed by a visit to Piccolina's Northern Italian Restaurant, an elegant dining spot frequented by many of the city's sporting teams. 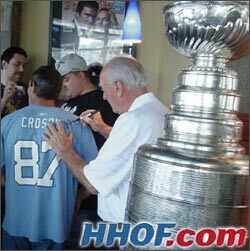 At both locations, Johnston allowed guests to have photos taken with the Stanley Cup. The final stop of the day was a private party at the home of his daughter Michelle, one of Ed and his wife Diane's three children. For three hours, friends and family members visited Ed and the Stanley Cup, getting photos and examining the names of the greats who have their names engraved on the magnificent silver trophy. While reflecting on the names that comprised the Stanley Cup teams from Boston on which he played in the early-seventies, Ed could only laugh as he shook his head. "I can only imagine how wild a Bruins' party would have been if they did back then what they do today (giving each player a day with the Cup)." Although Johnston was a member of several organizations, there is no doubt that he is a Penguin to the core. "This is the most blessed city in hockey," Johnston said on the Penguins' website. "We've had the best player every year for the last twenty years. First, it was Mario and then (Jaromir) Jagr. Now we have Sidney Crosby, (Evgeni) Malkin and (Jordan) Staal. We have a young, talented group. It's great to be around those kids." Towards the end of the evening, Ed Johnston took a moment to look back at his wonderful career. "It's been enjoyable," he said. "This franchise has been terrific to me. I've been blessed." On Friday, join the Stanley Cup Journal as we visit the celebration of equipment manager Dana Heinze.